Discs are the pillow-like sacs between your vertebrae that absorb the shock in your spine when you walk, jump and twist. Your discs are constantly filling up and reducing the amount of fluid inside them. Without the thick jelly absorbency in the discs, your spine would break and crack. The spinal discs fill up while you're lying down at night so that they're at their fullest in the morning. You're actually a little taller in the morning when the discs are filled up tightly. Morning exercises relieve the tightness so that your back can perform properly through all your daily activities. Consult your doctor before engaging in exercises that could interfere with ongoing back treatments or other complications. Before you even get out of bed, you can begin the process of loosening up your tight spinal discs. Remain on your back in the bed and bend your knees up toward your chest. With your knees bent, roll them to one side and then the other. Start with small arcs -- a few inches in each direction -- and increase the arc as your discs loosen up. Aim to touch your knees to the surface of the bed for the final arc. Move slowly and continue for a full minute. Long, slow, steady stretches are best to get your spinal discs prepared for the day's movements. On waking, lift your hands above your head and gently tug first one wrist and then the other, being careful not to bounce. Stay in your comfortable clothes and sit on the floor with your legs spread slightly. Slowly reach down to one side and try to grab your right ankle. Lower your head to your right knee and hold the position for 20 to 30 seconds. Slowly rise and repeat on the other side. Apply additional stretching to your lower back by lying flat on your back and raising your knees, wrapping your hands around your legs so that you can pull your knees toward your chest. Hold for 20 to 30 seconds and release. 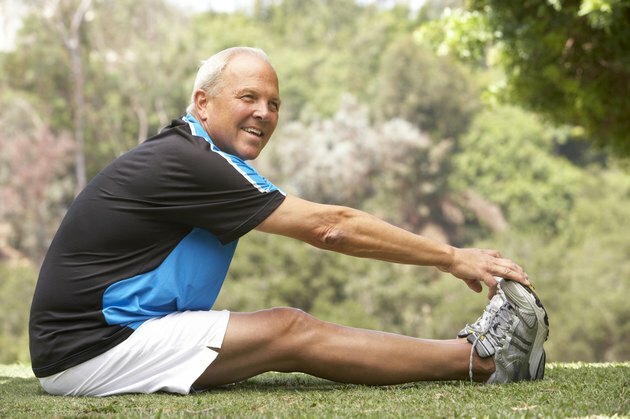 Continue your morning regimen with low-impact aerobic activity after careful stretching. According to the National Institute of Neurological Disorders and Stroke, 30 minutes of low-impact aerobics is ideal following long periods of inactivity. In addition to activating the fluid in your spinal discs, the exercises build muscle and boost your endurance levels. Appropriate early morning exercises include cycling or using a stationary bike, an elliptical trainer or treadmill. Swimming laps is an ideal exercise to loosen up your spine and increase spinal disc flexibility. The spinal discs are especially tight when you wake up in the morning, making them more vulnerable to damage, according to Your Better Back. Easy motions are most effective at this time. Always stretch and perform other exercises to a point that doesn't create pain. To prevent injury and damage to the fully hydrated discs, avoid heavy resistance exercises and sudden, intense movements. Aggressive bending first thing in the morning can create complications during the day.